The pros of cloud computing has made the service popular to most businesses that are eyeing an IT management system that can provide the necessary resources on demand while the price can be flexible depending on usage. This kind of flexibility of pricing and resources made cloud computing the ideal go-to service of growing businesses that are still establishing their online market. That is also why the cons of cloud computing are rarely discussed. One of the cons of cloud computing is the unexpected downtime. Since the managed server of the cloud takes care of everything, your website is dependent on it. Whenever the system experienced a downtime, it will definitely lose your online accessibility. No access is equal to no revenue. Your business could be temporarily suspended, and you won’t be able to access applications, data or ever the server. Technical outages can be the main cause of downtime. This is due to the overwhelming demand of multiple clients from the cloud service. Since cloud computing caters to multiple websites, there is a chance that the demand for computer resources is too much for the available servers. So, make sure that the cloud computing service provider that you will work with has the capacity to handle sudden peaks in demand to avoid unexpected downtime. Also, loss of power, low internet connectivity, out of service data centers due to maintenance are other reasons cloud computing can experience downtime. Thus, the direct effect of downtime to the business earnings made it the biggest concern among the cons of cloud computing. Just as they say, anything that you place into the Internet can be accessed by anyone online. Security is a legitimate concern in any business, and cybersecurity becomes a bigger concern since cybercrime has ways and means that could easily drag a business into bankruptcy in just a matter of days. Thus, one of the most bothersome cons of cloud computing is losing your data into the hands of people who might use them in criminal activities. Though the problem of security threat looms over the cloud computing service, we need to give credit to the best security standards and industry certifications that cloud computing adhere to. Indeed, the use of cloud computing will need you to provide your cloud computing provides the access to your business data. Make sure that you will only deal with a trustworthy cloud computing provider, or suffer from the consequences of data breach, information theft and other malicious attacks online. Storing data and important files on external service providers opens risks, like locking your front door while keeping your bedroom door open. It’s just a matter of time before cybercriminals can identify and exploit loopholes and vulnerabilities within your system, so keep your security tight and updated against cons of cloud computing. Even if flexibility is a major benefit from cloud computing, one of the cons of cloud computing is the vendor lock-in. If there is a need for migration, you might find it difficult to transfer from your provider to another. This could be caused by incompatibility with the current cloud platform. Interoperability and support issues will be leaving you no choice but stick with the current services. So before committing to one cloud provider, make sure that their set of terms would be acceptable when it comes to migration. The pros surely outweigh the cons of cloud computing, but we cannot deny that we also need to take caution in dealing with our cloud providers in order to ensure a service that could provide the real value of our money. 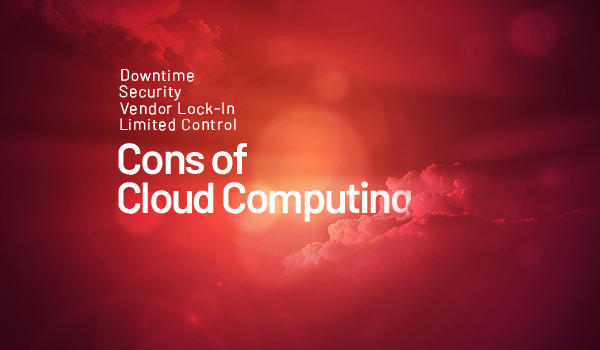 Know the cons of cloud computing, and you’ll know how to avoid the problems that may arise.